Kevin Barrett's radio show schedule: Eric Walberg on "The Canada-Israel Nexus"
Eric Walberg on "The Canada-Israel Nexus"
Broadcast here November 13th 11 to noon Eastern. All my shows are available at my Patreon page - please subscribe and keep this program going! "Canada and Israel were cut from the same cloth: settler colonies that dispossessed and killed natives to steal their lands. While there were stark differences— in the size of the colonies, their geopolitics, their historical period, and in the degree of ruthlessness exercised by the mother country and its settlers— they both are offspring of British imperialism." the Jews' "monopoly on the capital H version" of the Holocaust (24). (Walberg urges that the term be abandoned, and implicitly acknowledges the reasonableness of some of the questions raised by revisionists). 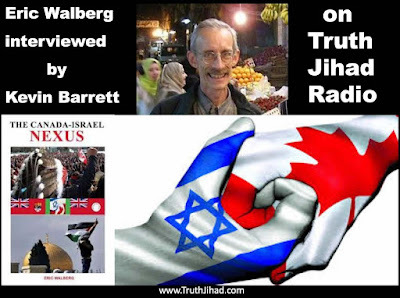 Walberg's book also contains an accurate description of the Zionists' "targeting" of University of Lethbridge professor (and False Flag Weekly News co-host) Anthony Hall (340) and other Canadian professors and activists. In this interview, Eric says he is happy to be an independent journalist and historian rather than an academician due to the increasing frequency of such Zionist witch-hunts. But before the above is taken out of context (are you paying attention, B'nai Brith?) please note that Eric Walberg is an admirer of the vibrant creativity of Jewish culture in general and the Canadian Jewish community in particular. The book celebrates Jewish achievements while simultaneously critiquing the distorted Judaism that has become Zionism. The Canada-Israel Nexus ends on a hopeful note, predicting that "At some point, anti-Zionism will become a core mainstream Canadian belief, as did anti-Apartheid before it...This new political nexus is taking shape now, bringing together a growing network of protesters, including Jewish Canadians, as well as natives of both Canada and Israel."